Small - $60.99 Only 4 left! Medium - $60.99 Only 6 left! Large - $60.99 Only 9 left! Your trusty bow is always by your side. Your fashion sense is unmatched. Wherever you point an arrow, your aim is true. You've been using that bow since before you could walk, and you've used it to fend off so many enemies you've lost count. You go through a lot of arrows, unfortunately, but you can just make your own, probably. How is all this possible? How can one woman be so powerful? Because you're the Midnight Huntress! (Now is when "The Final Countdown" starts playing!) Yes, striking fear into criminals, taking down those same criminals, shooting arrows impressive distances while being more precise than a... really good archer. Because you're not just a really good archer, you're an amazing archer. You think hitting a bullseye is hard? Try doing it while wearing heels! Sure, there may be female archers who are technically more "famous" than the Midnight Huntress, but those archers are too busy for the common people. They're too busy playing games, whatever you want to call it. Not you. Because you are too busy putting yourself out there. You're basically Batman, except you're an archer and you don't wear a mask. Who needs a mask when you can hit a target from twenty paces, no one even needs to know you're there! Any adversaries will think twice before messing with you when you're rocking this intimidating look. The costume includes a flexible tunic with metallic bird detailing, futuristic shoulder armor, and faux leather gauntlets. Whatever you do, you'll feel incredible doing it, because this costume immediately says "tough stuff" to everyone who sees it. 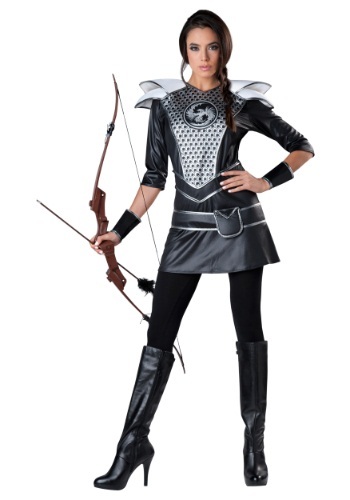 Just make sure you practice safe bow use out there, Midnight Huntress!